Barton Creek Greenbelt (and also along Lost Creek). The Lost Creek dam down from the Hill of Life, since it still has water, is one of the best spots in the winter along the Greenbelt. My kids can spend hours down there playing in the creek. Austin Nature Center. Just a mile from downtown, kids can dig in the sand, see rescued wild animals, and go on a short hike. Westcave Preserve. A beautiful trail leads to a stunning cave. Must take a tour to visit. Mayfield Park and Nature Preserve: Peacocks (! ), beautiful ponds, and an easy hike down to the lake. Wild Basin Wilderness Preserve: Several trails that are especially beautiful in the fall. Lovely hike to a pool with a small waterfall. McKinney Falls. My sons can spend an entire day here exploring the different waterfalls and other water features. Lady Bird Lake Hike and Bike Trail (especially the outcropping where the ducks gather). Red Bud Island (as long as there are not too many dogs there, but this park is usually overrun with dogs). Providing natural playspaces for children--whether directly in "the wild" or recreated in a park--is a big topic of conversation in Austin now. For example, parents in several neighborhoods (such as Brykerwoods and Barton Hills) are actively exploring ways to make their neighborhood park playspaces connect more with nature. There are lots of inspiring ideas out there on how this can we done. One of my new favorite blogs on playground design is Playground Designs Blog. And here is another great blog post on this topic. The Statesman reported this week that 2012 ranks as the deadliest year for pedestrians and cyclists in Austin history--and the year is not even over yet. So far there have been 28 auto-pedestrian deaths in 2012--up from 12 deaths just 2 years ago in 2010. A very sad statistic and a tragedy for those who lost their lives and their families. The City of Austin needs to examine closely what is driving this increase and should adopt an aggressive approach to eliminate these fatalities next year. First steps to beef up pedestrian safety? I have heard from several folks who say that the City desperately needs to hire a pedestrian director who could serve a role similar to that of the City's bicycle program director, albeit for pedestrians, by aggressively pursuing opportunities for safer and better pedestrian infrastructure. The City also needs to aggressively enforce laws barring texting while driving. And, in addition to enforcing our crosswalk laws, the City should put in place more light-protected crosswalks like the ones up on Barton Springs across from the Austin Energy building and on Lake Austin Boulevard across from the UT student apartments. It's ridiculous how often crosswalk laws are not enforced and are thus ignored in this City unless these lights are in place. Drive down Lavaca at around 17th Street any morning between 8am and 9am and watch the state workers line up trying to cross 3 lanes of traffic at the crosswalk while not a single car yields to them. It's traffic fatality #29 waiting to happen. The area where I live in Austin--South Lamar, just a mile from downtown--is undergoing a dramatic transformation. Literally thousands of new apartment units are being built along with new bars, food trailers, and other urban amenities replacing used car lots and fender bender repair shops. Indeed, this construction trend makes sense given the boom in "footloose young singles" moving here. 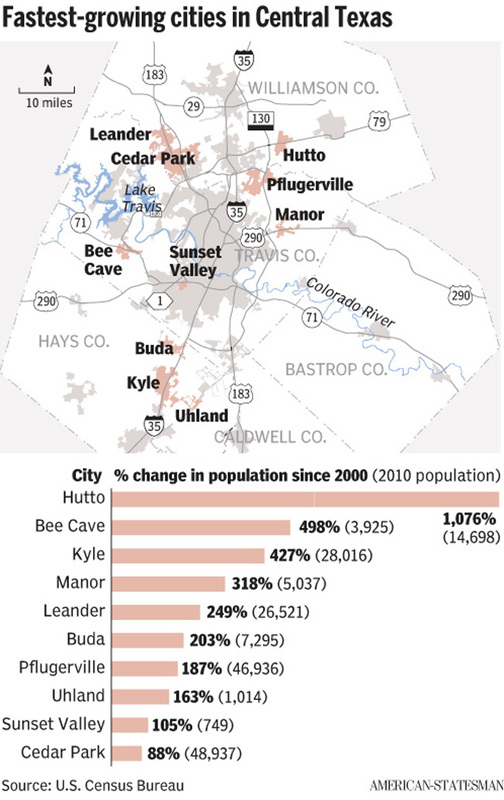 For several years now, Austin has been a top destination for people ages 25-34 moving to a new city. For 2009-2011, we were the 5th top destination (after D.C., Houston, Denver, and Portland), and before that we were #1. Austin also made #5 on the Wall Street Journal's list of cities that will emerge as the hottest destinations after the recession for highly mobile, educated workers in their 20s. Cities are thinking creatively about ways to attract these young adults. For example, last week I attended a meeting where the topic of discussion was cities' removal of regulatory barriers to micro apartments--apartments of around 300 square feet--to open up more affordable living options for the young adult set. Along South Lamar, the market is responding to the young adult population boom and corresponding tight rental housing market with the rapid construction of efficiencies and one bedrooms, although not yet at the micro level. Very few of the apartments units will contain two bedrooms, and three bedrooms will likely be non-existent. This limited range of bedroom counts and apartment sizes is unfortunate, at both ends of the spectrum. At some point, I hazard a guess that at least half of these young hipsters are going to abandon their footloose tendencies and have children (if they haven't already) and, low and behold, they will no longer want to live in an efficiency apartment. At the same time, they will find a dearth of family-friendly housing options they can afford in the urban core. 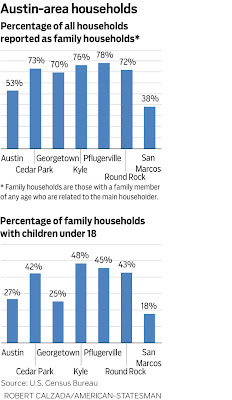 To retain these new families in Austin (and avoid becoming like San Francisco which has become nearly void of families), Austin needs to figure out how to provide a fuller range of housing types--beyond just efficiency apartments for young single adults--that fit our city's vision for a denser urban form. 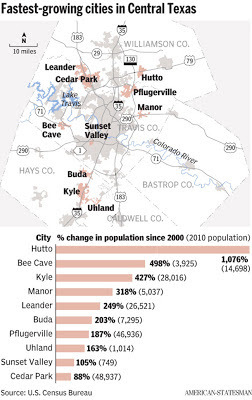 Otherwise, we will do nothing to contain urban sprawl and will continue to see families fleeing Austin to bedroom communities in surrounding cities along with all their spending power. 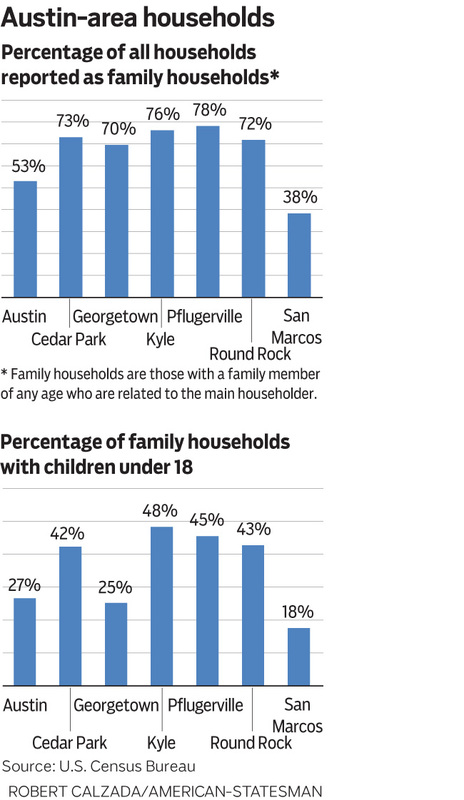 The suburban cities surrounding Austin have seen far higher rates of population growth than Austin has, fueled in large part by families' demand for more affordable, kid-friendly housing types. In the coming few weeks I plan to throw some ideas out there on bold steps we could take in Austin to make sure we are not only thinking creatively about how to attract young adults, but also how to retain them as they grow older and have children. 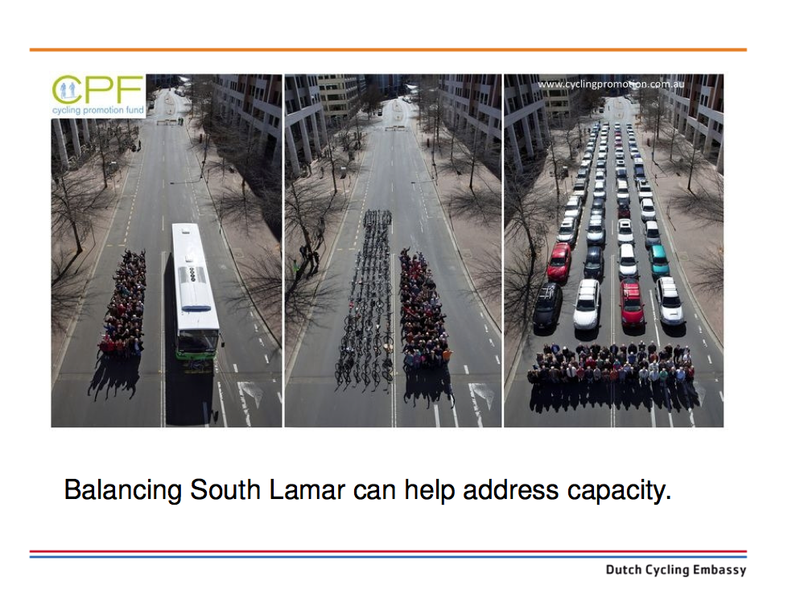 As I reported on Wednesday, transportation experts from the Netherlands met with Austin city planners and residents last week to looks at ways Austin can become more accessible to cyclists of all ages. 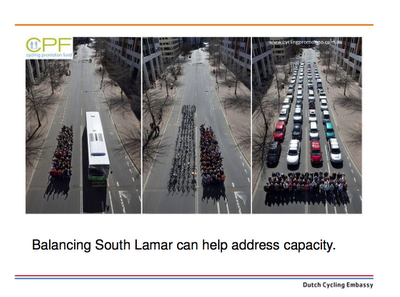 An update: The presentation from the South Lamar group--which looked at transforming South Lamar Boulevard into a safe, accessible, and attractive corridor for cyclists and pedestrians--is now up on the City's website, along with presentations from the other teams. These are fascinating to review. The main issue that the South Lamar team sought to tackle was how to increase transportation capacity along the South Lamar corridor via improvements to the pedestrian and cycling infrastructure, given that the roads are close to being maxed out at certain times in the day (with 35,000 vehicular trips per day and thousands of new apartments coming online). Forty percent of the car trips on South Lamar are for less than 5 miles. If part of these car trips could be converted into trips on foot or bike, then we have a win-win for drivers, neighbors, AND businesses along the corridor. Bad traffic = bad for businesses. Increased pedestrian and bike access = good for business.